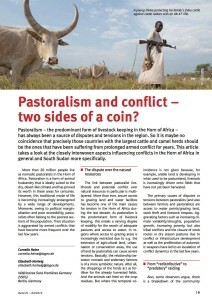 Pastoralism – the predominant form of livestock keeping in the Horn of Africa – has always been a source of disputes and tensions in the region. So it is maybe no coincidence that precisely those countries with the largest cattle and camel herds should be the ones that have been suffering from prolonged armed conflict for years. This article takes a look at the closely interwoven aspects influencing conflicts in the Horn of Africa in general and South Sudan more specifically.